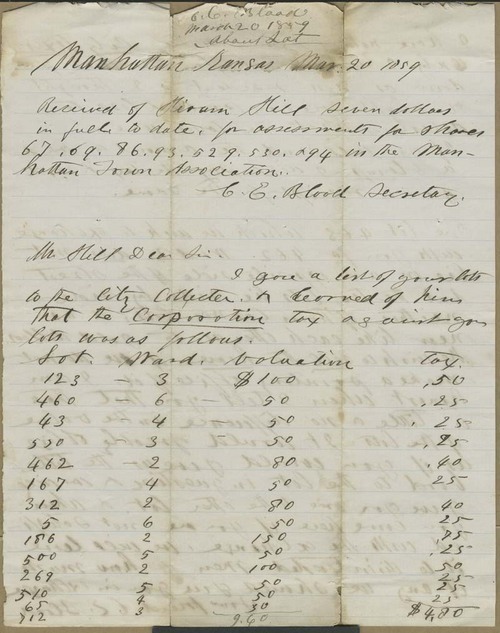 C. E. Blood wrote from Manhattan, Kansas Territory, to Hiram Hill in Massachusetts. Evidently, Hill had responded to Blood's previous letter with a list of his Manhattan properties. Blood had obtained the current values and tax rates for each lot while inquiring about the comparative value of the two men's town lots. A house had inadvertently been constructed on Hill's lot, instead of on the lot adjacent to his, as was intended, and Blood wanted to trade lots with Hill.